Summary: 2nd Place Judges' Choice in the Pick A Pic Challenge 2012. Carlisle is convinced that monogamy is overrated. Getting to know a certain red-haired young man, however, makes him question his philosophy. Some of the best one shots I've discovered are from challenges and contests in the fandom. 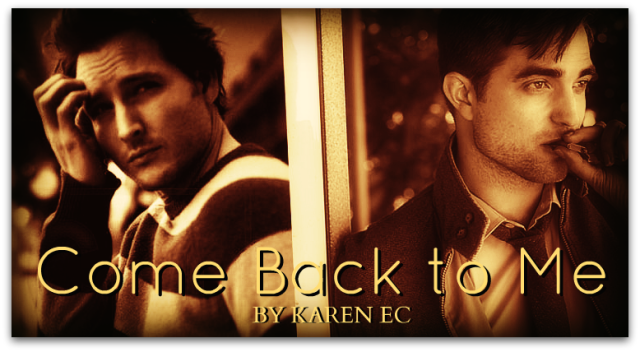 Come Back To Me is one such little gem. A rollercoaster of emotions between Carlisle assuming a stand of not being one for monogamous relationships to Edward exuding the persona of acceptance with the "non-commitment". The story initially begins leading you to believe just that, but then very quickly takes off leaving you emotionally gutted by Carlisle looking forward to a date, and not with Edward. I can't deny I was upset, but I kept on hoping for what I wasn't sure of. Carlisle coming to his senses, Edward walking away? Either way, I wanted more. karenecwriter gave me more thankfully. And the story unwound to be one that made me smile and secretly hoped she might continue. I really liked this one shot and was very pleased how the writer wrapped it up. I am always so amazed how a one shot can be packed full with a complete story line. Definitely give this little one shot of a gem a try, you won't be disappointed. Come Back To Me will put a smile on your face.